What was illegal has been reverted; you can once again borrow money from your rich uncle to buy your house. In Pennsylvania, you can participate in private financing deals again. Our government in its normal state of exaggeration and misappropriation deemed it necessary to make a law regarding mortgages. This was after Wall Street, Fannie and Freddie all really screwed up in the mortgage world. True to form our government went into complete overkill and enacted the S.A.F.E. Mortgage Licensing Act of 2008. This Act states that an individual who takes a mortgage application and negotiates a residential loan is breaking the law. This meant that if you asked your rich uncle to loan you $200,000 to buy your house, you were a law-breaker. If you asked the seller to keep money in the house you were buying, that was breaking the law. Residential mortgages were a strict no-no. This was only being regulated for about a year but was creating quite the uproar. Our government had enacted this law saying they were protecting the people. What they missed was that the people weren’t asking for protection. Besides this law actually did the opposite. When the people wanted money they went to the banks, and the banks were not in the lending mood so they didn’t lend. In times past the people would ask friends, family or the seller for assistance. This kept the bankers in check until their statesmen cronies helped then out by making it illegal. Secure and Fair Enforcement for Mortgage Licensing Act 2008. I’m most certain it’s not fair and secure but they picked the title, not me. The key here is “loan originator”. They define it as anyone that takes, offers, or negotiates a residential mortgage. This applies to “residential mortgage loans”. Owner occupied or as they state “personal, family, or household use” is prohibited. As far as I can tell, commercial mortgages and private loans or any other non-owner-occuppied residential mortgages are legal. Owner occupied real estate with a mortgage is what is at stake here. 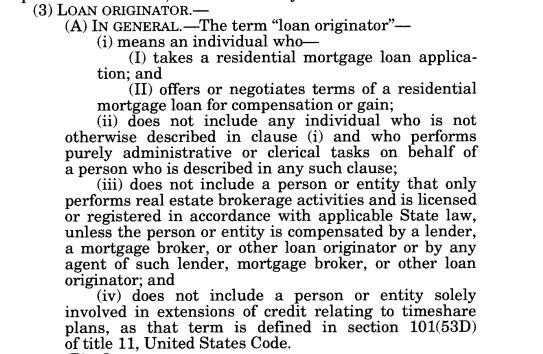 As a general matter, the Department will begin interpreting the provisions of the existing MLA regarding the definition of “mortgage originator” to the extent possible in a manner consistent with the HUD Regulation. Comment: the department does not view someone as a “mortgage originator” if he is involved in less than 3 residential owner-occupied mortgages. sellers of dwellings or residential real estate by means of an installment sales contract who engage in such business in a commercial context and habitually and repeatedly are required to be licensed as mortgage lenders and have their employees appropriately licensed as mortgage originators under the MLA. Comment: installment sales are mortgages. Now I’m not a lawyer or anything close to it so don’t take my word for it. Ask an attorney that can bill you $225 an hour. I spent around 5 hours researching this subject, it’s too bad I can’t bill at that rate. You can once again be involved in owner-occupied residential mortgages as long you do not exceed 3 per year. So go ahead and borrow from your rich uncle to buy your home. Jason Stoeser reblogged this on JADASFinancial Corp..
You need to research the Final Rules of the SAFE Act. The federal government sets the minimum standards, and there is no de minimus in the Final Rule. Don't miss the next article! Click on the link and I will send you an email when I post a new blog.